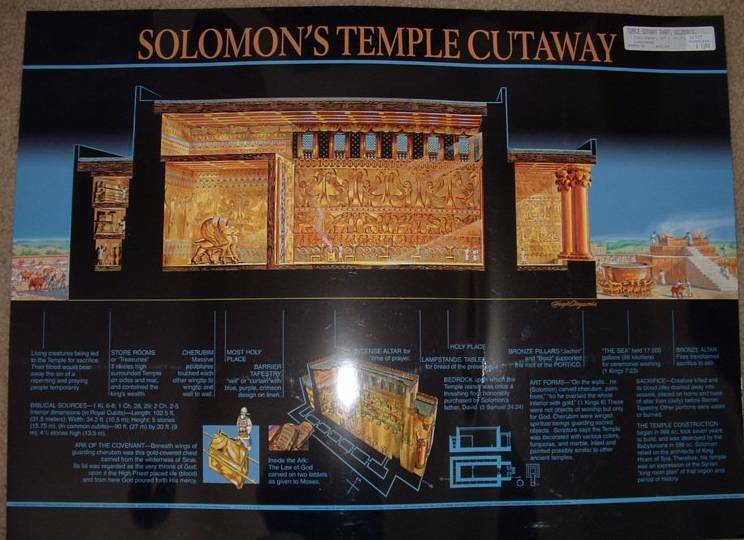 Now you can see the inside of the Old Testament Temple that was built by King Solomon in 960 BC. You can see the Ark of the Covenant, the massive gold cherubim, the huge pillars, the king's treasury, and the golden walls in this painting. It was magnificent: 90 ft. long and covered with literally tons of gold, silver, and precious stones that had been collected by King David. It was to be a house of prayer for all people. God's glory filled the Temple. Artist Hugh Claycombe used the description in the Bible-as well as artwork, art styles, and patterns used during the time of Solomon. He collaborated with archaeologists and others, to reconstruct the appearance of the Temple. In this new chart, a shaft of sunlight, hitting the solid gold Temple floor, reveals its reflective power, filling the magnificent interior with life and color, an awe-inspiring place to pray and worship. Within minutes, your students will know the key points and will grasp the wonderful Old Testament symbolism. Jesus is our great high priest and the perfect sacrifice for our sins. As believers in Christ, we are God's temple and God's spirit lives in us. Perfect for teaching on the life of kings David and Solomon. Chart size: 19.5" x 26". Reproducible worksheets and teaching tips on back of this chart. Lamination will not affect the ability to photocopy worksheets. Chart size: 19.5" x 26"